Juliane completed her undergraduate and postgraduate studies at the University of Central Lancashire. During this time, she worked as a Healthcare Support Worker in various mental health settings, including medium- and low-secure units and a hospital for patients with dementia. Following her graduation, she worked as a research assistant at Broadmoor Hospital for 12 months. The research project explored the nature and extent of both direct and indirect aggressive behaviours, as well as the role of environmental factors. In 2014, Juliane completed her PhD at the Centre for Forensic and Criminological Psychology under the supervision of Professor Anthony Beech, Dr. Catherine Hamilton-Giachritsis (University of Bath) and Dr. Leigh Harkins (University of Ontario Institute of Technology). The title of her PhD thesis is: 'An investigation into online sexual grooming and abuse of children via Internet technologies'. 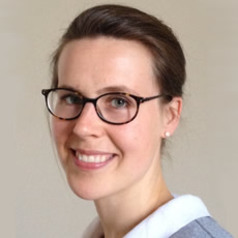 Since January 2015, Juliane has been employed as a postdoctoral research fellow on a research collaboration between West Midlands Police and the University of Birmingham, the University of Bath and Aston University. She is based at a specialist unit within West Midlands Police in the city centre. Juliane continues to carry out teaching activities on both undergraduate and postgraduate courses, including the Forensic Psychology Practice Doctorate.